The film industry has always looked to real life events for inspiration and today there are more movies based on true life stories than ever before. Some are more successful in their storytelling than others and some, of course, are more honest with their facts than others. In this post, I look at ten of the best, recent true life films. A United Kingdom tells the inspiring true story of Seretse Khama, the king of Bechuanaland (modern Botswana), and Ruth Williams, the London office worker that he married in 1948 in the face of fierce opposition from their families and the British and South African governments. Seretse and Ruth defied family, apartheid and empire. Their love triumphed against all odds and their story transformed their nation and inspired the world. Florence Foster Jenkins (portrayed by Meryl Streep) was a legendary New York heiress and socialite who obsessively pursued her dream of becoming a great opera singer. The voice she heard in her head was beautiful, but to everyone else it was awful. And yet, they loved her. Her “husband” and manager St Clair Bayfield (Hugh Grant), an aristocratic English actor, was determined to protect his beloved Florence. However, when Florence decided to give a public concert at Carnegie Hall in 1944, St Clair knew that he could no longer shield her from the truth. The Founder tells the true story of Ray Kroc who franchised McDonald’s and developed a phenomenally successful restaurant brand and real estate empire. How did a 52-year old, over the hill milkshake machine salesman build a fast food empire with 1600 restaurants and an annual revenue of $700m? Watch The Founder to find out. As an army medic, Doss single-handedly evacuated the wounded from behind enemy lines and braved fire while treating soldiers. He was wounded by a grenade and hit by snipers. Desmond Doss was the first conscientious objector (he preferred the term conscientious cooperator) awarded the Congressional Medal of Honor. When Mildred Jeter and Richard Loving got married in 1958 they could not have imagined the impact that their relationship would have on the US Constitution. At the time, in their home state of Virginia, interracial marriage was illegal under miscegenation laws. As a result, in the middle of the night just five weeks after their marriage in Washington DC, Richard and Mildred were arrested. Thrown into jail, they faced an agonising choice. Plead not guilty and risk significant jail time or plead guilty and accept a one year suspended jail term with the provision that they “both leave the state of Virginia at once and do not return together or at the same time to said county and state for a period of twenty-five years”. Recording guilty pleas, the couple moved to Washington DC. However, Mildred became deeply unhappy. In desperation, she wrote a letter to US Attorney General Robert F Kennedy, who passed it on to the American Civil Liberties Union (ACLU). The ACLU took the Loving’s case all the way to the US Supreme Court where, after a four year legal battle, the Court ruled in their favour and held that anti-miscegenation laws were unconstitutional. Seconds after reading these words on 15th July 1974, Christine Chubbuck, a reporter working for a television news station in Florida, pulled out a revolver and shot herself in the head - live on air. Chubbuck was rushed to hospital where she died 14 hours later. She was 29 years old. What drove this smart and ambitious woman to such an act? Was her suicide the result of a battle with clinical depression? Or did she take her life in defiance of the growing level of sensationalism in the media where ‘if it bleeds, it leads’? 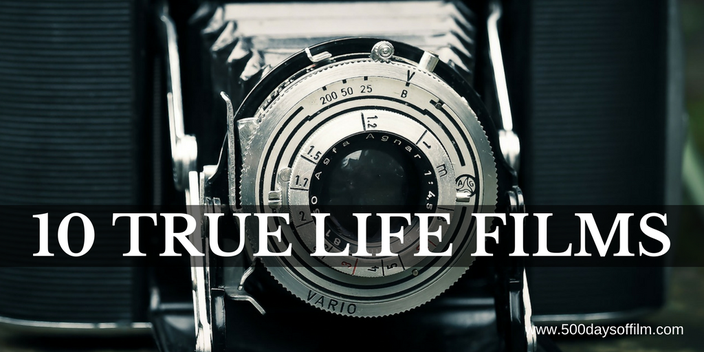 What Is Your Favourite True Life Film? These ten movies are my favourite true life films that have been released over the past year. There are, of course, many more superb movies based on real events. Do you have a favourite true life film? If you do, let me know in the comments section below!